Alternative (Energy) Facts – from Environmental Defence, et al. I started receiving messages last night on a sorta report by Environmental Defence (ED), and as I am still receiving them, I thought I’d write some thoughts – if only to simply copy a link when again asked for my thoughts. Electricity prices in Ontario have risen in recent years, putting the squeeze on some Ontario residents and businesses. There are many reasons for the increase in electricity prices and renewable energy is one of them. However, the role of renewables in diving up electricity bills has been vastly exaggerated. the next biggest factor in increased rates is, according to ED, solar. 3 other factors show as increasing rates, all in equal amounts – 1 is nuclear, another is “conservation” (facilitated by increased distribution costs), and the final is the increase in the Harmonized Sales Tax caused by all the other increases. There’s not only a perception that renewables have been driving up bills, it’s really quite obvious that they have been. Environmental Defence probably doesn’t receive funding to see the obvious. Some remarks on their latest “backgrounder” – keep in mind “Fact” is used sarcastically. ED claims their words are based on “research” done by Power Advisory LLC, but endnotes require requesting that work. My experience indicates that consultant will say what they are paid to say, so I’m unenthusiastic about reading more of their “work”. I’ve already showed the role renewable have had in recent increases, but I’ll note whereas they show wind as 6% of the average consumer bill and solar another 5%, their figures also indicate wind and solar are 23% of all actual generation costs. The analysis attributing portions of rates to generation types is not one I want to provide as I’d wish to also account for the cost of subsidizing exports and the cost shifting penalty to residential consumers of the Industrial Conservation Initiative – which amplify the cost impact of additional, and unnecessary, generation. All the contracts entered since 2009 are unnecessary, and the entire cost of all those contracts not only falls on the smallest consumers of power, transmission and distribution costs also were incurred to facilitate the waste. To the green blob, every cost forced on others is small. This section of the backgrounder blames a correct statement by the Auditor General as creating the perception of the Global Adjustment as a subsidy, when in reality Greenpeace originated that fairy tale. Our biggest difference is solar, where I estimate $1.71 billion and ED show only $1.3 billion. We also differ in wind, where I show $1.54 billion and ED’s “backgrounder” shows $1.37 billion. So who is most correct? The system operator displays monthly global adjustment components in Figure 23 of their monthly reporting.While most generation types are spread in multiple categories, wind and solar are displayed separately. It would be preferable to have access to the numeric data, but data is never perfect, and all of us with computers have the ability to capture images, and cut-and-paste sections to measure the total for 2016. If you did this I think you’ll find wind around $1.54 billion, and solar definitely more than wind at over $1.6 billion. I’d question the integrity of Power Advisors in underestimating solar, if I thought it existed. The IESO’s new website has a page with a link to a Global Adjustment by Components spreadsheet that produced the graphic I analysed in this post. I said the IESO graphing for 2016 looked to show wind at $1.54 billion while the spreadsheet shows $1.55 billion; I wrote solar looked to be over $1.6 billion and the spreadsheet shows $1.63 billion. Power Advisory’s work is confirmed to be as poor as I thought, yet ED’s figures will continue to be quoted as people, particularly journalists, continue to confuse so-called environmentalists with credible sources. The section on this “fact” concludes with mangling valuations from a report of the Auditor General of Ontario. I’ll note the discussion is about how much extra feed-in tariffs paid above what the previous methods of procurement would have costs. Environmental Defence’s backgrounder mentions the $9.2 billion over the course of the contracts might have had a net present value, in 2015, of $5.3 billion, and then divides by the 20-year contact length – and concludes only $460 million a year is unnecessarily wasted. No wonder it’s presented as a mere $460 million a year. This section hashes up two opposite approaches to comparing costs. It starts with 2014 numbers from a Survey of Household Spending, which was used by Ontario’s Financial Accountability Office (FAO) in a report I criticized at the time. 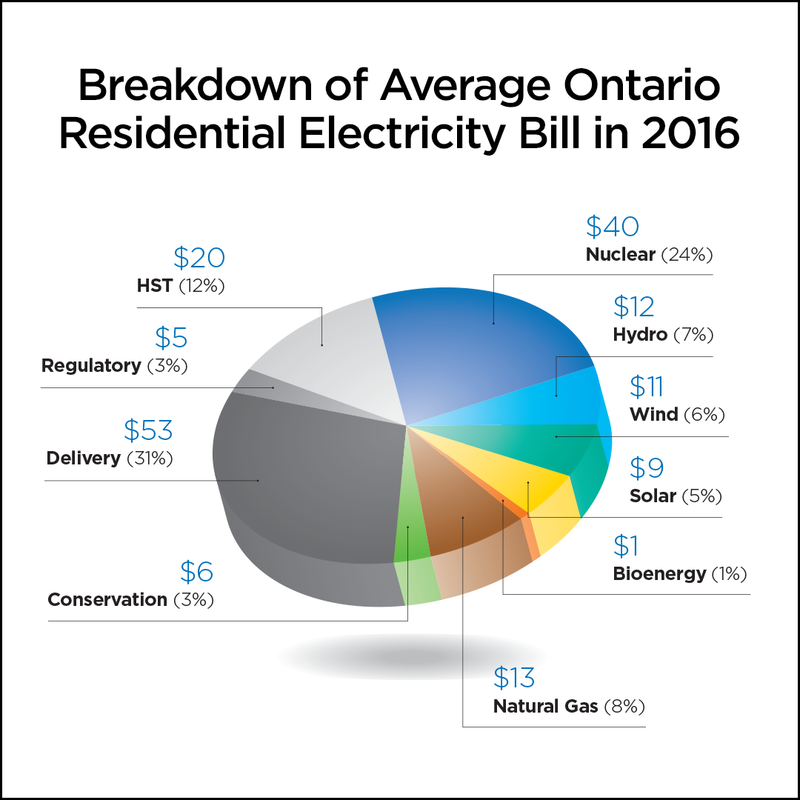 This FAO report looks at total dollars spent, and Ontario only looked favourable on electricity spending when compared to provinces without the access to natural gas much of Ontario enjoys. The report then swings to Hydro Quebec’s comparison of rates and shows what that entity estimates cost in cities would be for a residential consumer who consumes 1000 kilowatt-hours a month. As hardly anybody in a major city does consume 1000 kWh a month, this mostly compares consumers that don’t exist – it is the exact opposite approach of the FAO’s as it tells you nothing about what average people actually spend. The HQ survey also converts to Canadian dollars – so American cities look much more expensive since our dollar dropped (along with the price of oil), although rates in the United States have changed very little over the past decade. The ED “backgrounder” then travels to Europe to make Ontario rates attractive. Of course this bundles taxes into the pricing – although they exclude taxes in charting pricing in comparing North American cities. Ontario’s rate increases aren’t due to heavy taxes – as Europe’s elevated rates mostly are. Ontario’s increases are due to needlessly expensive, and completely unnecessary, contracts. The coal phase-out refuge is the fetal position of the Green Energy Act (GEA) vandals. Some wind and solar was contracted when the generation mix to replace coal was planned – most was contracted long afterwards, including all the post-GEA procurement. Not in Ontario. The average price of wind in Ontario has been rising due to years, due to the procurement strategies enforced by the GEA. It is true the future of nuclear at Ontario Power Generation, may be prohibitively expensive, but the Bruce Power agreement doesn’t present the same threats as OPG’s rate application. 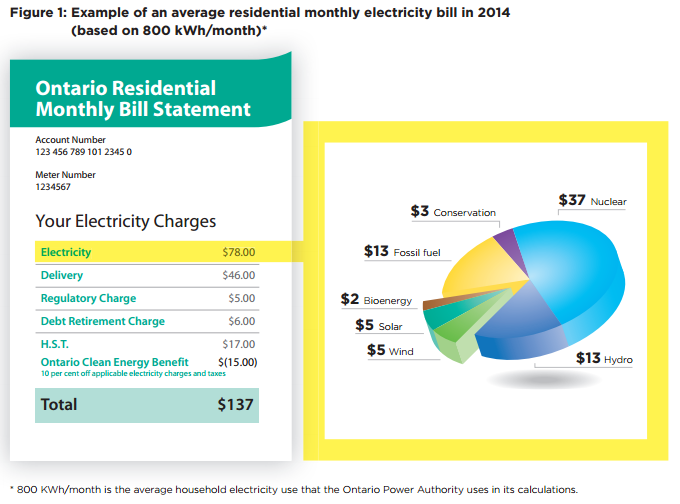 However, wind and solar are not replacements for nuclear in Ontario as neither has significant capacity credit/value. A decade after the first industrial wind turbines entered operation in Ontario, the green energy crowd still cannot issue an honest report, let alone grapple with addressing the additional system costs their products inflict on ratepayers. ED is wrong to present a “renewables vs. nuclear” option. One is a real option. Predicting what will be is strange in a “backgrounder” – but so is denying the real costs than have driven the cost increases of the past decade. Having shown an inability to learn anything ever, it’s not surprising their conclusions never change. Can 20 year contracts be amortized over 30 years? Thanks for this Scott. Really appreciate your work. Almost beyond belief how shameless groups like ED and the OCAA can be when it comes to twisting or ignoring fact. Also hard for me to believe I once supported their efforts. Where is the defense of the environment when you advocate for more destroyed landscapes, river systems and increasing fossil reliance? It is obvious that all the high priced over-educated idiots in Queen’s Park are sitting on their brains! It was said that all who ignore history are doomed to repeat the same mistakes again. Germany is a lot further along the road of renewable energy and their hydro cost is 40c/kw today! WE are being led down the same road and making all the same mistakes again. All we can do is to provide a new broom for her to fly off into the sunset come election time!!!!!!!!! !